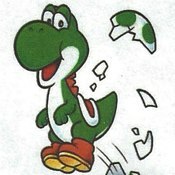 Description: Super Mario Evolution Features Yoshi as the main character! Its a 2D game with 9 levels and play like Mario. A lot of sky jumping and it's not too hard fortunately.